is an American genus of herbaceous perennial, dicotyledonous plants that contains over 140 known species. 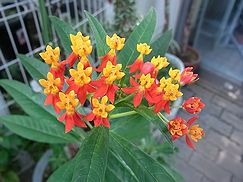 It previously belonged to the family Asclepiadaceae, but this is now classified as the subfamily Asclepiadoideae of the dogbane family Apocynaceae. Milkweed is named for its milky sap, which consists of a latex containing alkaloids and several other complex compounds including cardenolides. Some species are known to be toxic. Carl Linnaeus named the genus after Asclepius, the Greek god of healing. 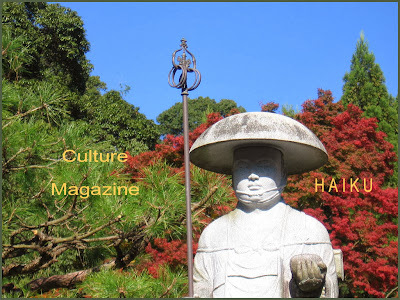 It was introduced to Japan at the end of the Edo period. beyond our fence . 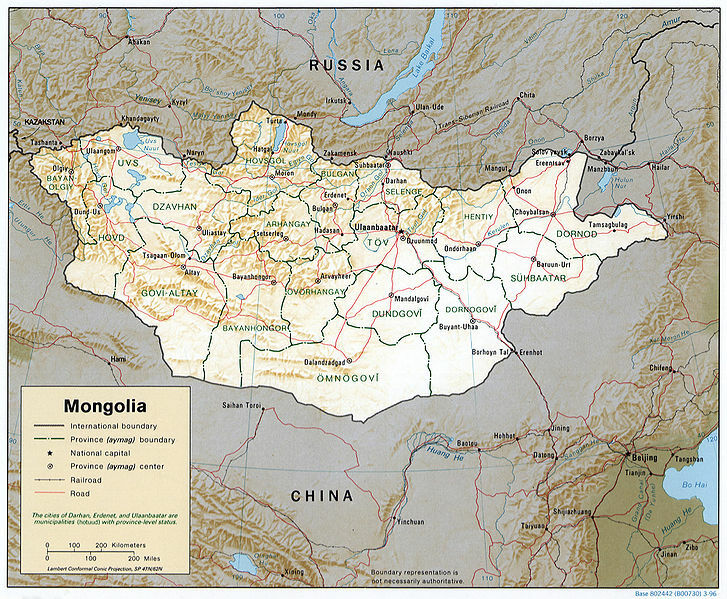 . .
is a landlocked country in East and Central Asia. ..... 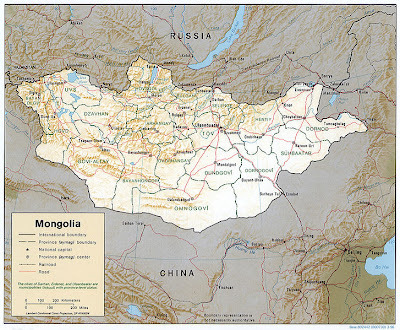 The area of what is now Mongolia has been ruled by various nomadic empires, including the Xiongnu, the Xianbei, the Rouran, the Gökturks and others. The Mongol Empire was founded by Genghis Khan in 1206. After the collapse of the Yuan Dynasty, the Mongols returned to their earlier pattern of constant internal conflict and occasional raids on the Chinese borderlands. ..... The geography of Mongolia is varied, with the Gobi Desert to the south and with cold and mountainous regions to the north and west. Much of Mongolia consists of steppes. ..... Most of the country is hot in the summer and extremely cold in the winter, with January averages dropping as low as −30 °C. Mongolia is high, cold, and windy. It has an extreme continental climate with long, cold winters and short summers, during which most of its annual precipitation falls. which usually refers to a category of arid rangeland with insufficient vegetation to support marmots but with enough to support camels. Mongols distinguish Gobi from desert proper, although the distinction is not always apparent to outsiders unfamiliar with the Mongolian landscape. Gobi rangelands are fragile and are easily destroyed by overgrazing, which results in expansion of the true desert, a stony waste where not even Bactrian camels can survive. an element or colour and an animal.
. The Lunar Mongolian Calendar .
. . . . . K I G O . . . . .
. Birds of Spring .
. Cherry blossoms бүйлс .
. Edelweiss Цагаан уул цэцэг .
. Golden Eagle Festival .
. Hay, haystack, haycock .
. Hoarfrost, hoar frost хяруу .
. Naadam festival- "the three games of men" .
. School year begins .
. White Moon - Tsagaan Sar .
. zud, dzud (зуд) snowy cold winter .
. Animals of Mongolia .
. Flowers of Mongolia .
. Antelope, Saiga antelope .
. boot bells for babies .
. Camel, Mongolian camel .
. dung of animals .
. Eight Horses of Happiness .
. 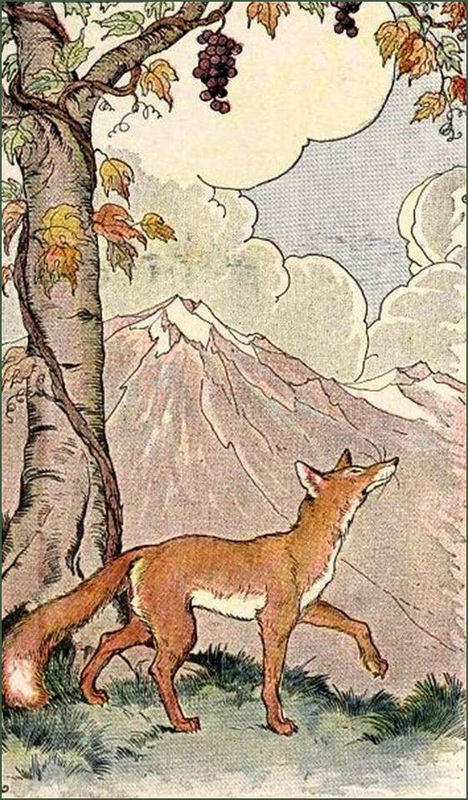 Felt Fox to protect a baby . a Japanese samurai who went to Mongolia?
. Gobi desert steppe . - - - . Gobi 黄砂　- yellow sand in Japan .
. Harumafuji Kohei 日馬富士 公平 .
. Homi, Hömi, Homie, Khöömei - throat singing .
. Lama Bird - mandarin duck .
. Mongolian Milk Tea .
. Mongolian Ship from 13th century .
. shagai - ankle bones/ nuckle bones .
. Steppe, Mongolian-Manchurian steppe .
. Turtle and Dragon . Topics mentioned in "Beyond the Limits"
. Poets from Mongolia . The oldest completely passed down work of Mongolian literature is probably also the most well-known abroad: The Secret History of the Mongols. It does, however, contain passages of older poetry. ..... 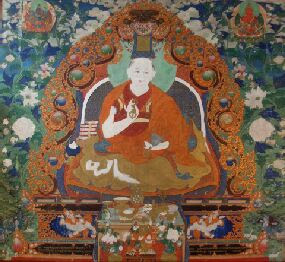 Already at the time of the Mongol empire, samples of Buddhist and Indian literature became known in Mongolia. 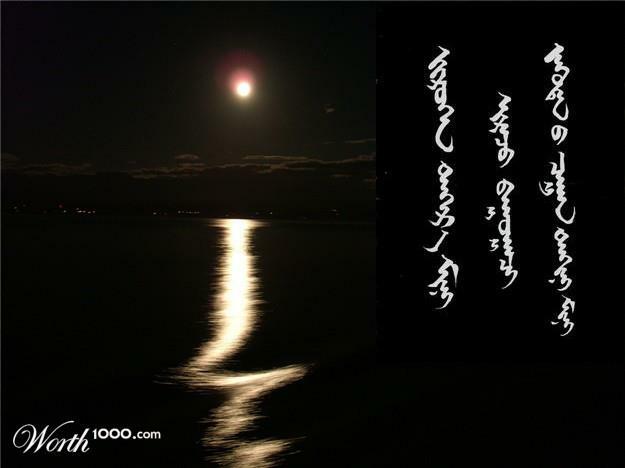 Haits is one of short form poetry in Mongolia similar with Japanese haiku. It has 3 lines. For haits the form is not important. No kigo, no 5 7 5 syllables. Most important rule of haits is author's feeling and sensation specialty and its philosophic quality. Haits should reflect the human philosophic aspects, combining author's soul and affliction. Mongolian youths have a desire to feel free like our large steppe. So they have independent concepts. It is maybe because of our traditional nomadic life. So, Mongolian people like much this kind of poetry.
. The Universe Triples . also known as Uyghurjin Mongol bichig, was the first writing system created specifically for the Mongolian language . . . Under the general editorship of the eminent Mongolian poet G. Mend-Oyoo, an important dual-language anthology of American poetry has appeared in Ulaanbaatar (Mongolian Academy of Culture and Poetry). Mend-Ooyo's own name tranlates roughly as "Man of the Secret Code," and a woman we met is "Lucky Violet." 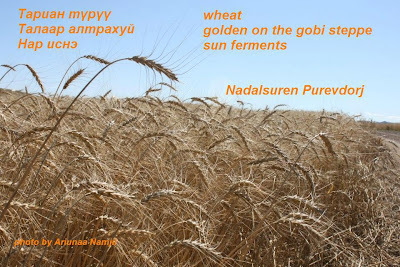 When I wrote seven haiku for Mend-Ooyo, I incorporated some of these details and other examples of how in the Mongolian imagination images substitute for abstractions. Marriage, for example, means "linked pillows" in Mongolian. 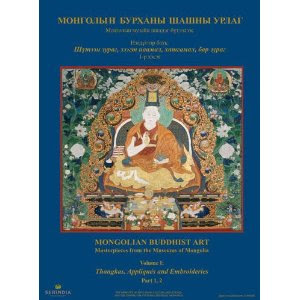 features Mongolian art from prehistory through the early twentieth century. 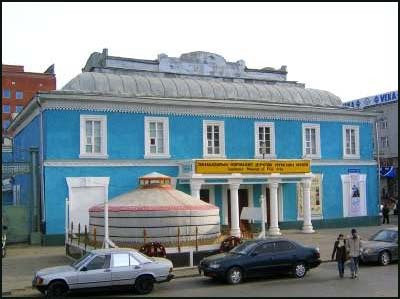 The present museum building, located in central Ulaanbaatar, was constructed in 1905 by a Russian merchant. At various times in its history, the building served as a Chinese bank, a Russian Red Army soldier's office, and a department store. The building was inaugurated as the Museum of Fine Arts in 1966.
. Gabi Greve , 2004 - Handfans . is the capital of Arkhangai Aimag (province) in Mongolia. ***** . WKD : Yellow sand 黄砂 (こうさ) koosa . Seven poets from the Mongolian group "Beyond the Limits" have contributed about 250 haiku to this collection. 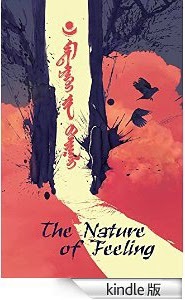 This is no ordinary haiku or poetry collection. 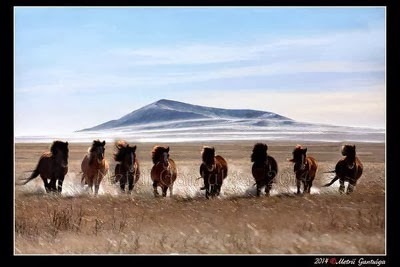 Do you know much about Mongolian culture? This is an opportunity to become more knowledgeable of their poetry and culture and thought. Also it is just a chance to enjoy some remarkable haiku. Mongolian poets, it seems, want to make a mark on the world of haiku. With this collection, I think we can agree that they have. 2014 is the year of the Horse in Asia. Actually 8 horses symbolized luck and happiness in Feng Shui in China. Mongolian artists brought wider meaning expressing horses in different attitude and motion as they have lifestyle tightly related with horsemanship. 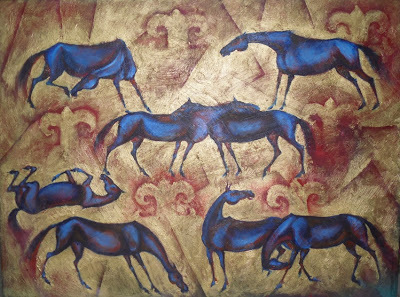 So each horse symbolizing certain meaning like freedom, friendship etc. 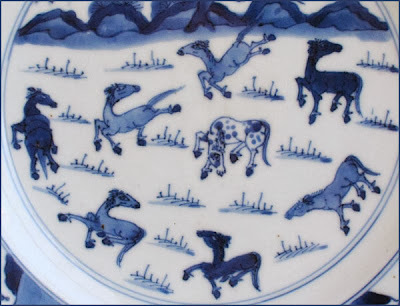 The eight horses of King Mu of the Zhou Dynasty was a popular theme for porcelain decorations from the Transitional into the Yongzheng period (1723-35). The story originates from a historical romance, the Mu tianzhi zhuan (An Account of Emperor Mu), which describes the journeys of the fifth emperor of the Zhou dynasty (1023-983 BC) during which he met Xi Wangmu - the Queen Mother of the West - at Yaozhi (the Jade Pond). The story is about King (Wang) Mu, who dreamed of being an immortal God. He was determined to visit the heavenly paradise and taste the peaches of immortality. A brave charioteer named Zaofu used his chariot to carry the king to his destination. The The Eight Horses of Wang Mu became a popular subject among later poets and artists and a symbol for the vehicle or journeys of any emperor. There is the symbol "Eight horse of happiness" and we respect it. 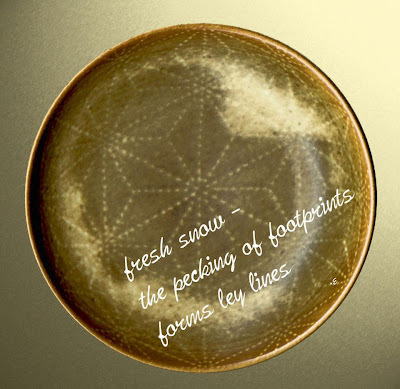 This is a group on facebook to share haiku with a cultural keyword. 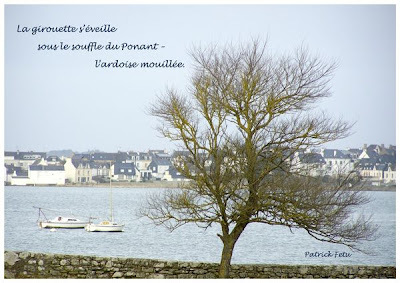 through the many cultural words he used in his poems.
. WKD : Topics and Keywords for Haiku .
. MORE Place Names of the World - shared on facebook .
. WKD : MORE Personal Names - shared on facebook .
. Assumption day of Mary .
. Barnabas Gospel, Turkey .
. Bechamel, béchamel sauce .
. Bloodroot flowers, Sanguinaria canadensis .
. Blues - Nuit bleue (Blue night) music .
. Fishery, fisheries for fishing .
. Golem - and Prague .
. Hallelujah songs - Canticle of the Sun .
. Hurling - game of ancient Gaelic origin, .
. Lakota Sioux Dancers - The Black Hills & Badlands .
. Moon pie and Royal Crown Cola .
. "Morning Glory" cloud formation .
. Pithecanthropus erectus - Java Man .
. Pope Francis I .
elected on 13 March 2013.
. Sunstone and the Vikings .
. tomatillo (Physalis philadelphica) from Mexico .
. Visual Pollution - pylons .
. Yggdrasill, ygdrasil - Norse mythological tree, .
. Zuni rain prayer and frog, North America . The Café de Flore, at the corner of Boulevard Saint-Germain and Rue St. Benoit, in the 6th arrondissement, is one of the oldest and the most prestigious coffeehouses in Paris, celebrated for its famous clientele. The classic Art Deco interior of all red seating, mahogany and mirrors has changed little since World War II. Like its main rival, Les Deux Magots, it has hosted most of the French intellectuals during the post-war years. was a prominent Greek statesman and orator of ancient Athens. His orations constitute a significant expression of contemporary Athenian intellectual prowess and provide an insight into the politics and culture of ancient Greece during the 4th century BC. Demosthenes learned rhetoric by studying the speeches of previous great orators. He delivered his first judicial speeches at the age of 20, in which he argued effectively to gain from his guardians what was left of his inheritance. 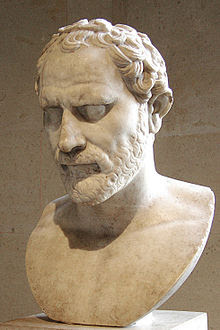 For a time, Demosthenes made his living as a professional speech-writer (logographer) and a lawyer, writing speeches for use in private legal suits. ... je pense à Démosthène ! ... I am thinking of Demosthenes ! is a beach located on the Bukit peninsula, on the island of Bali, Indonesia. The beach provides basic accommodation and cafes for surfers and day-trippers. It is also renowned for its dangerous shorebreak. Dreamland Beach is the site of the failed Pecatu Graha development, planned by Tommy Suharto, the youngest son of the former president Suharto. And birds probably served as radar once a voyage of discovery had begun. Shorebirds fly away from land in the morning and back in the afternoon, so sightings suggest the direction of land less than a day’s flight away. It’s even likely the explorers brought shorebirds with them and set them loose now and again. Like Noah’s dove, a bird that had found land nearby would not return. were a mythical people who lived far to the north of Thrace. The Greeks thought that Boreas, the North Wind, lived in Thrace, and that therefore Hyperborea was an unspecified region in the northern lands that lay beyond the north wind. 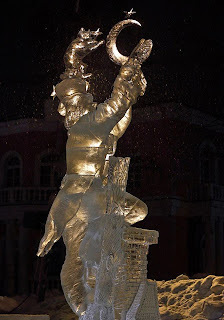 Their land, called Hyperborea or Hyperboria – "beyond the Boreas" – was perfect, with the sun shining twenty-four hours a day, which to modern ears suggests a possible location within the Arctic Circle. The Hyperboreans were believed to live beyond the snowy Riphean Mountains which Homer first referenced in his Iliad. Ley lines are alleged alignments of a number of places of geographical and historical interest, such as ancient monuments and megaliths, natural ridge-tops and water-fords. The phrase was coined in 1921 by the amateur archaeologist Alfred Watkins, in his books Early British Trackways and The Old Straight Track. He sought to identify ancient trackways in the British landscape. Watkins later developed theories that these alignments were created for ease of overland trekking by line-of-sight navigation during neolithic times, and had persisted in the landscape over millennia. In 1969 the writer John Michell revived the term "ley lines", associating it with spiritual and mystical theories about alignments of land forms, drawing on the Chinese concept of feng shui. He believed that a mystical network of ley lines existed across Britain. is the Federal District (Distrito Federal), capital of Mexico and seat of the federal powers of the Mexican Union. It is a federal entity within Mexico which is not part of any one of the 31 Mexican states but belongs to the federation as a whole. Mexico City is the country's largest city as well as its most important political, cultural, educational and financial center. "Bésame Mucho" is a Spanish-language song written in 1940 by Mexican songwriter Consuelo Velázquez.
. WKD : more about Mexico . 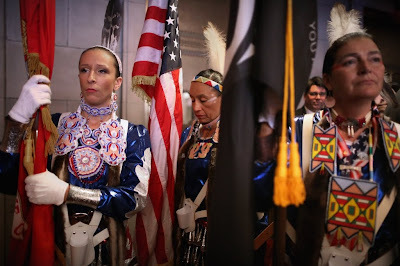 Watch carefully during President Obama’s second inaugural parade Monday, Jan. 21, and you will see among the marching bands and the civic organizations a small group of women wearing bright dresses embroidered with the beading of their tribes and the insignia of their service. They are the Native American Women Warriors (NAWW), and they’re recognized as the country’s first all-female, all-Native American color guard. In Greek mythology, Pandora (Greek, Πανδώρα, derived from πᾶς "all" and δῶρον "gift", thus "all-gifted" or "all-giving") was the first woman. As Hesiod related it, each god helped create her by giving her unique gifts. Zeus ordered Hephaestus to mold her out of earth as part of the punishment of humanity for Prometheus' theft of the secret of fire, and all the gods joined in offering her "seductive gifts". According to the myth, Pandora opened a jar (pithos), in modern accounts sometimes mistranslated as "Pandora's box", releasing all the evils of humanity—although the particular evils, aside from plagues and diseases, are not specified in detail by Hesiod—leaving only Hope inside once she had closed it again. She opened the jar out of simple curiosity and not as a malicious act. A parent-teacher interview (also a parent-teacher conference and parents' evenings in the UK) is a once per term, short conference between students' parents and teachers. The interview is a chance for parents to meet their child's teachers and review any issues or concerns the parents or teachers may have with child/student's performance. These interviews are usually between five to fifteen minutes long. Parent-teacher interviews are a tradition in Western school systems (notably Australia, Canada, the UK (where they're known as parents' evenings) and the United States). A video example can be seen here. In the United States, many elementary schools will shorten the school day by 2–3 hours (often for an entire week) in mid fall to allow extra time for teachers to give these conferences. At the beginning of the 17th century, merchants who were trading with India established warehouses in Port-Louis. They later built additional warehouses across the bay in 1628, at the location which became known as "L'Orient" (the Orient in French). In 1664, during the reign of King Louis XIV, the French East India Company was established at Port-Louis. The company established a shipyard at Lorient. The Company was not able to maintain itself financially, and it was abolished in 1769. In 1770, King Louis XVI issued an edict that required the Company to transfer to the state all its properties, in return for which the King agreed to pay all of the Company’s debts and obligations. The French government then took over the shipyards as a naval port and arsenal. Tap dance is a form of dance characterized by using the sound of one's tap shoes hitting the floor as a percussive instrument. As such, it is also commonly considered to be a form of music. Two major variations on tap dance exist: rhythm (Jazz) tap and Broadway tap. Broadway tap focuses more on the dance. It is widely performed as a part of musical theater. Rhythm tap focuses more on musicality, and practitioners consider themselves to be a part of the Jazz tradition. Tap dance has roots in African American dancing such as the Juba Dance, English Lancashire Clog dancing, and probably most notably Irish stepdancing. It is believed to have begun in the mid-1800s during the rise of minstrel shows. et les piétons des pointes. and the pedestrians toe dance. a minor Jewish holiday, occurring on the 15th day of the Hebrew month of Shevat (in 2013, Tu Bishvat will start from sunset on 25 January and finish at nightfall on 26 January). It is also called "Rosh HaShanah La'Ilanot" (Hebrew: ראש השנה לאילנות), literally "New Year of the Trees." In contemporary Israel the day is celebrated as an ecological awareness day and trees are planted in celebration. 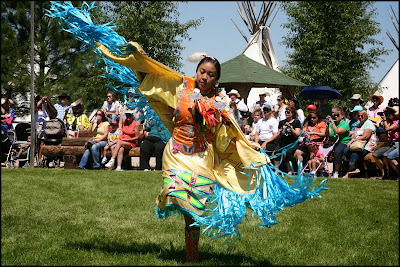 Wind River Indian Reservation is an Indian reservation shared by the Eastern Shoshone and Northern Arapaho tribes of Native Americans in the central western portion of the U.S. state of Wyoming.
. WKD : Worldwide Saijiki List . Contributions from friends at "Joys of Japan". permit me to add the poems as comments for a while.
. Culture Magazine - Haiku .
. Cardiff - Merchant Seafarers War Memorial .
. Emirates and oasis .
. Fidalgo Island - Washington USA .
. Guemes Island, Washington, USA .
. Lake countries, USA .
. Peterhof Palace - Russia .
. Russia - Church Tserkov Pokrova na Nerli .
. Russia - Kitezh, the "Russian Atlantis " .
. Sacre Coeur, Paris .
. Sochi - Olympic Games 2014 .
. Sudan - ancient kingdoms .
. Vatican, Swiss Guards . a Mongolian term for an extremely snowy winter in which livestock are unable to find foodstuff through the snow cover, and large numbers of animals die due to starvation and the cold. The term is also used for other meteorological conditions, especially in winter, that make livestock grazing impossible. Locals differentiate between black, white, cold, and iron/ice zuds. The black zud (har zud) consists of a lack of snowfall combined with freezing temperatures, which causes drought. The white zud (tsagaan zud) is caused by very heavy snow fall, which makes it impossible for the livestock to feed on the otherwise accessible frozen grass, causing famine. The cold zud (khuiten zud) occurs when the temperature gets extremely low for consecutive days, so that animals must conserve body temperature instead of grazing freely. 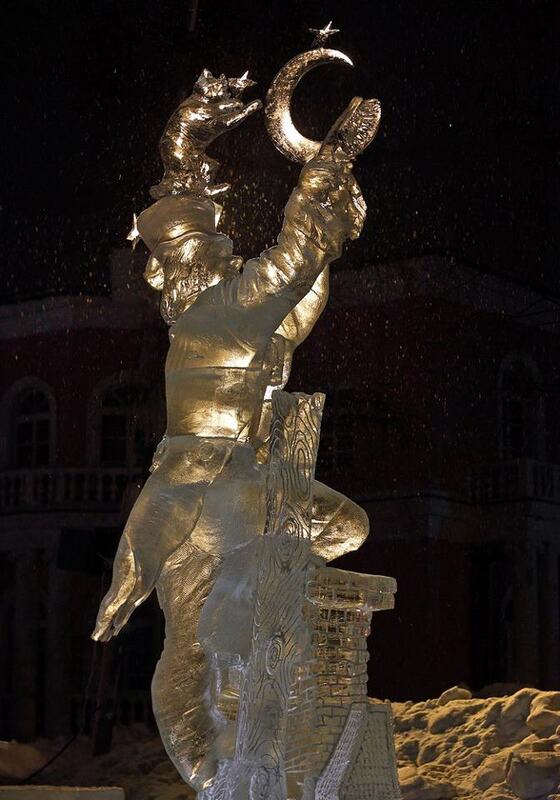 The iron zud (temur zud) is brought about by rain which freezes and covers the land in ice hindering the animals from feeding on grass or herbs. Some also refer to a storm zud (shuurgan zud), in which snowstorms of high winds and drifts are dangerous for herds. The economy of Mongolia has long been heavily dependent on pastoral farming, and harsh zuds can cause economic crises and food security issues in the country. It is not uncommon for zuds to kill over 1 million head of livestock in a winter. The 1944 record of almost 7 million head of livestock lost was shattered in the 21st century. Of note, the arctic oscillation in both 1944-45 and in 2010 was pushed much deeper into Central Asia bringing prolonged extreme cold weather. 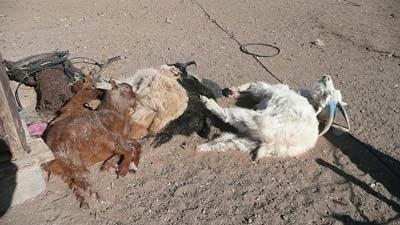 In 1999/2000, 2000/2001 and 2001/2002, Mongolia was hit by three zuds in a row, in which a combined number of 11 million animals were lost. In winter 2009-2010 80% of the country's territory was covered with a snow blanket of 200-600mm.In the Uvs aimag, extreme cold (night temperature of −48°C / -54°F) remained for almost 50 days. 9,000 families lost their entire herds while a further 33,000 suffered 50% loss. The Ministry of Food, Agriculture and Light Industry reported 2,127,393 head of livestock were lost as of February 9, 2010 (188,270 horse, cattle, camel and 1,939,123 goat and sheep). The agriculture ministry predicted that livestock losses might reach 4 million before the end of winter. But by May 2010, the United Nations reported that eight million, or about 17% of the country's entire livestock, had died. ***** . WKD : The Season of Winter . is a fragrant rice dish cooked in coconut milk and "pandan" leaf commonly found in Malaysia, where it is considered the national dish; Brunei; Singapore; Riau Islands; and Southern Thailand. It is not to be confused with nasi dagang sold in the Malaysian east coast states of Terengganu and Kelantan although both dishes can usually be found sold side by side for breakfast. 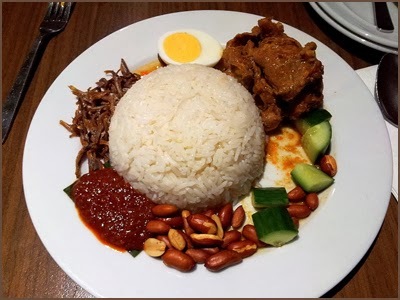 However, because of the nasi lemak's versatility in being able to be served in a variety of manners, it is now served and eaten any time of the day. Sir Richard Olof Winstedt have written about "nasi lemak" in Malaysia 1909 in his book "The Circumstances of Malay Life". With roots in Malay culture and Malay cuisine, its name in Malay literally means "coconut rice", but is taken in this context to mean "rich" or "creamy". The name is derived from the cooking process whereby rice is soaked in coconut cream and then the mixture steamed. This is the same process used to make a dish from their neighbouring country, Indonesia, which is nasi uduk from Jakarta and nasi gurih from Aceh, therefore those dishes are quite similar. Sometimes knotted screwpine (pandan) leaves are thrown into the rice while steaming to give it more fragrance. Spices such as ginger and occasionally herbs like lemon grass may be added for additional fragrance. Traditionally, nasi lemak is served with a platter of side dishes wrapped in banana leaves, including cucumber slices, small fried anchovies (ikan bilis), roasted peanuts, hard boiled egg, and hot spicy sauce (sambal). As a more substantial meal, nasi lemak can also come with a variety of other accompaniments such as ayam goreng (fried chicken), sambal sotong (cuttlefish in chilli), cockles, stir fried water convolvulus (kangkong), pickled vegetables (acar), beef rendang (beef stewed in coconut milk and spices) or paru (beef lungs). Traditionally most of these accompaniments are spicy in nature. Nasi lemak is widely eaten in Indonesia, Malaysia and Singapore, even as a dish served in Indonesian and Malaysian schools. Commonly a breakfast dish in both countries, it is normally sold at hawker food centres in Singapore and roadside stalls in Indonesia and Malaysia. It often comes wrapped in banana leaves, newspaper or brown paper, or it could be served on a plate. However, there are restaurants which serve it as a noon or evening meals, making it possible for the dish to be eaten all day. Nasi lemak kukus which means "steamed nasi lemak" is another name given to nasi lemak served with steamed rice. Siti Aishah Abdul Wahab promised her elder sister that she would go back in nine months time, donned the tudung that she gave her and said goodbye. That is the memory that 73-year-old retired teacher Kamar Mahtum will bring back with her after the emotional reunion on Thursday night with her long lost sister, widely reported as being enslaved by a Maoist cult in South London for the past thirty years. The 40 minute meeting, which was made possible with the help of the British police and the Malaysian High Commission here, was held at a secret place in London. Met by the Malaysian media at Heathrow airport before her departure for Malaysia today, Kamar related how she sobbed loudly upon seeing her sister before telling off Siti Aishah for putting the family on an emotional trip over the past 45 years. colloquially known simply as mangosteen, is a tropical evergreen tree believed to have originated in the Sunda Islands and the Moluccas of Indonesia. It grows mainly in Southeast Asia, and also in tropical South American countries such as Colombia, in the state of Kerala in India and in Puerto Rico, where the tree has been introduced. 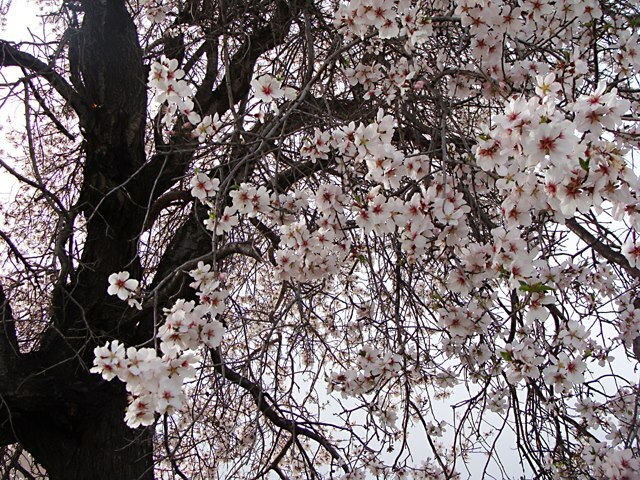 The tree grows from 6 to 25 m (20–82 ft) tall. The fruit of the mangosteen is sweet and tangy, juicy, and somewhat fibrous, with an inedible, deep reddish-purple colored rind (exocarp) when ripe. In each fruit, the fragrant edible flesh that surrounds each seed is botanically endocarp, i.e., the inner layer of the ovary. 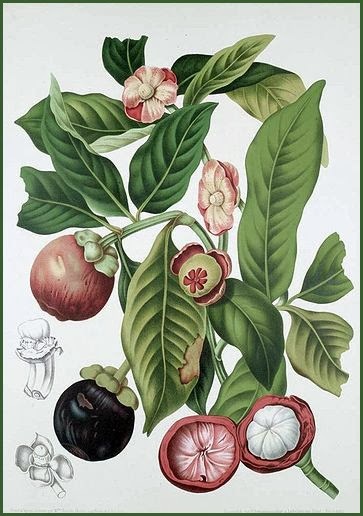 A description of mangosteen was included in the Species Plantarum by Linnaeus in 1753. Haiku: Dreaming Of Exotic Fruits . . .
- As we know mangosteens are dark brown in color when ripe. On the contrary the flesh is bright white and juicy with a sweet taste. But, one should bear in mind that the juice when get in contact with your cloth, the stained will remain permanently and appeared like a black spot! Locally known as 'Sukun' and this breadfruit usually eaten fried or with gravy. - Back in Malaysia, breadfruits is kind of having the link with the British when they were here. They prefer to have then raw as it tasted like bread. But to the Malaysian culture, they prefer it fried, so the choice is up to the individuals. Favorite local fruit, called the king of fruits. - Durian season is much awaited for from any other fruit seasons in Malaysia. Durian plantation are usually found in the village where old folks reside. Other members of the family rarely visited them in the village, but when the durian season comes, you can see all the relatives flocking home in the village. This incident is always quoted as 'instant family'! This fruit is commonly grown in South East Asia region. - Jackfruit is quite tedious when it comes to peel of the fruit, it contains some sort of latex of gum from the skin. Usually you hands get sticky and messy by the chore. I believe there is no English equivalent, name that is, to this local fruits. - Rambutan trees are usually quite tall but still one has to look up to see them. Buying a ready plucked rambutans from the tree is a difference experience when one pluck them from trees. By using a long pole, rambutans were brought down, and we usually eat them with free style of gnawing the skin to open it and eat the flesh.